The simplest and most cost-effective type of life insurance is generally term insurance, which provides coverage for a specified number of years, as long as you pay the premiums, and pays a death benefit if you die within that term. A term policy has no other value and is separate from your savings and investments. Universal life and variable universal life insurance are more complex products that combine a death benefit with a tax-advantaged savings element. A portion of the premium pays for the pure cost of insurance. The remainder is invested with the potential to build cash value on a tax-deferred basis. 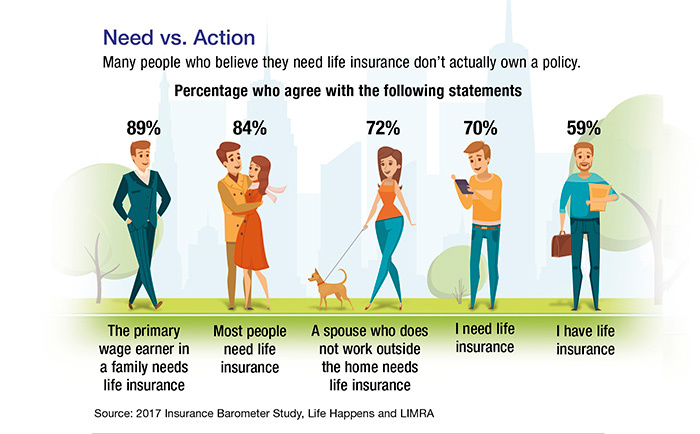 A universal life (UL) policy premium is invested in the insurance company’s general investment portfolio. Most UL policies pay a minimum guaranteed rate of return and may offer returns above the guaranteed minimum depending on the performance of the insurance company’s portfolio. The policyholder has no control over these investments. Any guarantees are contingent on the financial strength and claims-paying ability of the issuing company. With a variable universal life (VUL) policy, you can choose to invest your cash value in a variety of investment options. The value of your policy has the potential to grow more quickly, but it is also subject to greater risk. The investment return and principal value of the investment options will fluctuate. If your investments do not perform well, your cash value and the death benefit (which are not guaranteed) may decrease. You can vary the frequency and amount of premium payments for both types of policies, as well as increase or decrease the death benefit (subject to underwriting for increases). For example, if your financial situation improves, you can increase your premiums and build up the cash value more rapidly. On the other hand, if you face a financial strain, you can reduce your premiums or possibly deduct premium payments from the cash value. Many policies can be structured so that the invested cash value will eventually cover the premiums. Of course, the premium will affect the rate at which your cash value accumulates. A reduced premium may also reduce the death benefit, depending on the policy and cash value. You can generally make tax-free withdrawals, up to the amount paid in premiums, or borrow against the accumulated cash value. Although policy loans accrue interest, they are free of income tax as long as they are repaid, and they usually do not impose a set schedule for repayment. When policy loans, withdrawals, and investment losses reduce the policy’s cash value and death benefit, additional premium payments may be required to keep the policy in force. There are contract limitations, fees, and charges associated with UL and VUL insurance in addition to premiums. They can include mortality and expense charges, account fees, investment management fees, administrative fees, and charges for optional benefits. If a policy is surrendered prematurely, there may be surrender charges and income tax implications. VUL investment options are not guaranteed by the FDIC or any other government agency; they are not deposits of, nor are they guaranteed or endorsed by, any bank or savings association. Variable universal life is sold by prospectus. Please consider the investment objectives, risks, charges, and expenses before investing. The prospectus, which contains this and other information about the variable universal life insurance policy and the underlying investment options, can be obtained from your financial professional. Be sure to read the prospectus carefully before deciding whether to invest. Securities offered through American Portfolios Financial Services, Inc. Member FINRA/SIPC (FINRA/SIPC). American Portfolios Financial Services, Inc. and American Portfolios Advisors, Inc. are not affiliated with any other named business entities mentioned. This communication is strictly intended for individuals residing in the state(s) of AZ, CA, CO, HI, NE, NV, OR, TX and WA. No offers may be made or accepted from any resident outside the specific states referenced.